“The Snake”, “Fashion Frank” and “The Lynwood Leadfoot” were several nicknames of stock car racer, Frank Gawlinski, who passed away on November 23 at the age of 71. Battling chronic health issues the past dozen years or so, Gawlinski was a front-running late model stock car driver from the Chicago area in the 1970s, 80s and into the 90s, especially at the now-shuttered Illiana Motor Speedway in Schererville, Ind., where he was the late model division track champion a record nine times. A product of Calumet City, Gawlinski was involved in drag racing, both on the strip and street, before venturing into stock car racing at Blue Island’s Raceway Park in 1976. He would win five feature races in the track’s hobby stock class before moving up into the track’s late model ranks in 1977. That year saw Gawlinski compete in the hobby stock class first before coming out later in the season with his own black late model Chevelle. Gawlinski came into his own in 1978 when he took over the driving chores of the yellow Lange’s Restaurant and Lounge Camaro No. 14 – a number that would become Gawlinski’s signature numeral. 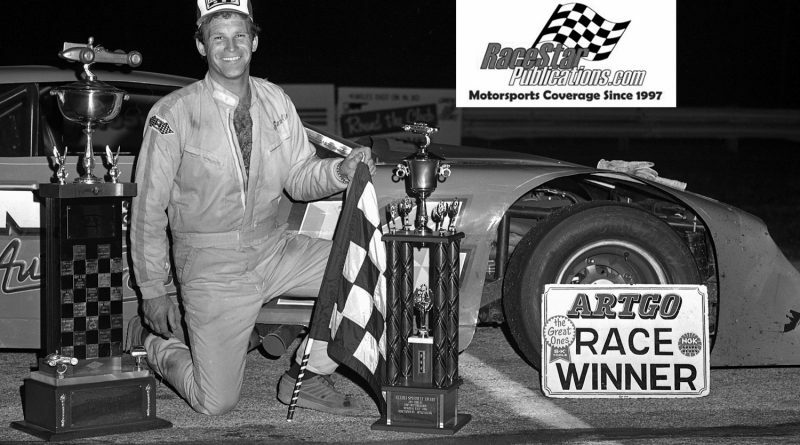 He was the second-ranking late model driver at Raceway Park in 1978, winning 11 feature races at the “World’s Busiest Track.” Scoring his first career late model feature win on July 4, 1978, during a night that he would win both holiday twin 50-lap events, Gawlinski would win a total of 52 late model feature races at the tight quarter-mile paved oval during his career. In 1979, Gawlinski began to branch out away from his home base of Raceway Park, testing his skills at Illiana Motor Speedway and Grundy County Speedway in Morris, Ill. He won his first feature race at Grundy, the third-of-a-mile paved fairgrounds oval, on August 31, 1979. Gawlinski would win for the first time at Illiana in 1980, posting six feature wins and his first season championship at the half-mile paved oval in northwest Indiana. A $1,000/50-lap victory at Henry’s Speedway in Boswell, Ind., over Memorial Day weekend added to a pretty successful 1980 season. 1981 saw Gawlinski finish third in the points at Raceway Park, where he raced most of the year. As the season drew to a close, Gawlinski debuted a new Camaro, which he would drive to victory in the Tony Bettenhausen Memorial 100 at Illiana, the first of a record nine Bettenhausen 100 wins for Gawlinski. 1982 saw Gawlinski become the first driver to win both Illiana’s late model season crown and the Bettenhausen 100 in the same year. Racing out of Lynwood, Ill., Gawlinski had established a habit of winning, whether at Raceway Park, Illiana or Grundy. Gawlinski would take overall honors in Raceway Park’s Super Monza 300 three times, 1980, 1981 and 1982. He would win the Grundy late model championship in 1987, winning 13 feature races during the year at the “Friday Night Racin’ Place.” Gawlinski would capture the annual Lee Schuler Memorial 50 lapper at Grundy three times, ending up with a career total of 32 feature victories at the Morris oval. Gawlinski’s last of nine track titles at Illiana would come in 1996. He would end up scoring a total of 131 feature wins on the sometimes quirky and old paved Illiana surface. Gawlinski was the second-ranking driver at Illiana in 1997 and eighth in 1998 – his final year of competition. Gawlinski certainly spent a lot of time alone – out front, leading the way and winning. Frank Gawlinski poses in victory circle after winning the Tony Bettenhausen Memorial 100 late model stock car race at Illiana Motor Speedway in Schererville, Ind., in 1981. Gawlinski would win the annual Bettenhausen contest a record nine-times and was also the late model track champion at the northwest Indiana speedway nine times, another record. Gawlinski passed away on November 23 at the age of 71. Stan Kalwasinski photo.